Extracapsular Lateral Suture Stabilization (ELSS) is a surgical procedure that provides stability to the unstable canine knee. The instability is the result of a torn cranial cruciate ligament (CrCL). Knee stability is necessary for proper leg function and comfort. The CrCL, sometimes called the anterior cruciate ligament (ACL), is the most important joint stabilizer in the knee. It connects the femur (thigh bone) to the tibia (shin bone) and prevents the tibia from sliding forward during normal leg use. CrCL rupture is the most common source of knee problems in all sizes and breeds of dogs with all levels of activity. The ligament may be either fully or partially torn, but once damaged, has virtually no capacity to heal. Instability results, producing knee pain that manifests as lameness. Only surgery can restore proper limb stability and function. How Does Extracapsular Lateral Suture Stabilization Work? 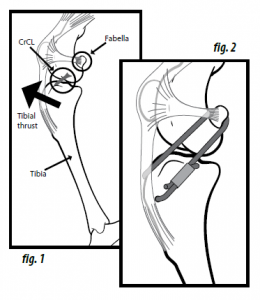 The ELSS works by counteracting tibial thrust with a specifically placed suture. Tibial thrust is caused by the transmission of weight up the tibia (shin bone) and across the knee, which causes the tibia to “thrust” forward relative to the femur. It is because the top of the tibia is sloped, not flat, that forward tibia movement (thrust) occurs (Figure 1). The CrCL normally opposes this force, but when torn, is incapable of preventing tibial thrust. The ELSS counteracts tibia motion by “anchoring” the tibia to the femur with a specially placed suture. To accomplish this, a monofilament suture material is passed around the fabella (a pea-sized bone attached to the femur). The suture is then passed through a bone tunnel created at the front of the tibia and looped back and attached to itself (Figure 2). Can Extracapsular Lateral Suture Stabilization be Performed in Any Size Dog? We typically do not perform this procedure on larger dogs (more than 35 pounds), but there is no lower limit on patient size. We define success with ELSS as dramatic improvement in limb function, resolution of pain, and a return to normal or near normal activity. Based on these measures, ELSS has a success rate of better than 90% in smaller patients. Even though our results have been very consistent with this procedure, because of the nature of a CrCL injury, it is not realistic to expect every patient to have the exact same recovery or results. Some dogs may have some limitations with more intense activities or have intermittent knee stiffness following injury and an ELSS procedure. What are the potential complications with this surgery? MedVet has tremendous experience with this procedure, and the complication rate for ELSS as performed by our surgery team is very low. Low-grade infections uncommonly develop, and when they do, resolve completely with proper treatment. Anesthesia itself carries a small risk of complications. At MedVet, we take many precautions to ensure that anesthesia is as safe as possible. We use the same drugs and monitoring equipment that are used for procedures in humans. We employ two board certified anesthesiologists and highly qualified anesthesia technicians, a team relied upon for anesthesia in thousands of patients annually. Is Surgery Performed the Day of My Consultation Appointment? No. Your pet must be evaluated before surgery. This entails a complete medical history, physical examination, and a discussion of the procedure. Preoperative bloodwork may also be performed depending on your dog’s age and health. How Long Will my Dog Stay in the Hospital? ELSS patients stay overnight after the surgery is performed and are released the next day. Medications for conditions such as diabetes or low thyroid function should not be stopped. Medications for knee pain may be continued up to the day of surgery. Oral steroids (even for skin conditions) should ideally be stopped one week prior to surgery. What is the Surgery Aftercare? The most important thing following surgery is restricting your dog’s activity, especially for the first six weeks. No off-leash walks are allowed during this period, and leash walks should start light and gradually increase in length. Stairs and slippery floors must be avoided for the first six weeks following surgery, and no jumping, playing or running is allowed. When your dog is not under your direct control, he/she should be kept confined to a small room, cage or crate. All of these restrictions will be discussed with you and written down at the time of your dog’s discharge from MedVet. Is Postoperative Physical Rehabilitation Important After ELSS? A torn CrCL results in muscle atrophy, joint scar tissue, arthritis, and reduced range-of-motion in the knee. Physical rehabilitation helps to reverse these changes and return the leg back to pre­injury function. Physical rehabilitation such as swimming and aquatic treadmill exercise is available and should greatly enhance your dog’s recovery. Please refer to MedVet’s Rehabilitation brochure for more information or inquire with your surgery team. Do I Have to Bring my Dog Back to MedVet for a Check-up? If possible, we prefer to re-evaluate our ELSS patients at MedVet. Typically, only skin suture removal and a 6-week postoperative re-evaluation is required. Will Arthritis Develop Over Time? Many patients already have at least mild arthritis at the time of surgery. Arthritis can be a cause of and/or a result of a torn CrCL. Once the ELSS is performed and the instability is resolved, improved knee function and comfort is expected, even in the presence of severe arthritis. Even when arthritis is present, it is often not associated with significant pain or lameness. Can my Dog Re-injure the Same Knee After ELSS? We have not observed significant lameness due to re-injury. Occasionally dogs will develop short-term lameness after a fall or other injury. Rest and anti-inflammatory medication normally results in the return of comfortable limb function in these dogs. What is the Chance that My Dog will Rupture his/her CrCL in the Other Knee? Approximately 20-40% of dogs will rupture the opposite CrCL at some point in their lifetime. Is There Anything I can do to Prevent CrCL Injury in my Dog? It is well established that overweight dogs have a greater risk of CrCL injury. Weight management is recommended and will benefit both the operated and unoperated leg. What Happens if I Don’t Have Surgery for My Dog? Permanent lameness and progressive severe arthritis is expected in patients that do not have surgery to treat a torn CrCL. Markedly decreased activity level, chronic knee pain, and diminished quality of life are expected. Is an ELSS the Only Treatment Available for My Dog? No. Other surgical options do exist for CrCL injuries. Many combined factors are considered in technique selection. These include your dog’s weight, size, age, current health status, and pre-injury activity levels. Options will be discussed with you during the preliminary consultation with the MedVet Surgery team.